The tiny house movement really took off in the past year, which means that if you are interested in your own small home, you are spoiled for choice. Here are some of the current offerings in the tiny house movement, both overseas and closer to home. An architectural firm based in Colombia, Colectivo Creativo Arquitectos, have come up with a modular prefab made of interlocking modules. In Denmark, LUMO Architects have been charged with designing a collection of shelters for several islands, including Skaro, Drejo and Birkholm, after winning a competition. They have a distinctive, asymmetrical appearance and are covered in woodchips coated in black-pigmented wood tar oil. 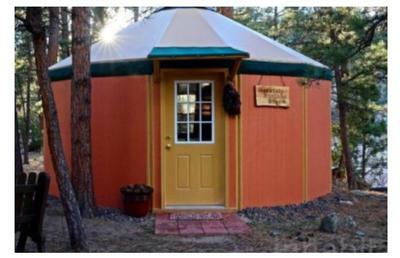 If you prefer you tiny homes to be more, well, circular, Freedom Yurt Cabins have come up with a responsibly sourced pine yurt with solid, insulated walls. According to Inhabit.com, they can be put up or taken down in a couple of hours by two to three people. So how about Australia? Happen Films have released a YouTube tour of Fred and Shannon Schultz’s off-the-grid house on wheels in Victoria. Fred, who runs Fred’s Tiny Houses, spent about about three years designing and a year building the 10-square-metre home. The total material cost was about $45,000. 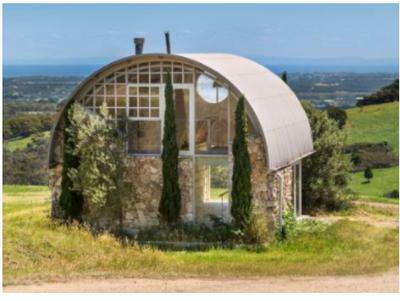 Also a bit closer to home, on the listings front, an architect-designed stone dwelling in Main Ridge, Victoria is for sale. Set on 26 hectares, it comes with a building permit and plans to extend to a four-bedroom house. Another studio is located on the property if the minimalist lifestyle doesn’t particularly appeal. And up in New South Wales, the “Zig Zag Cabin” at Wollombi is on the market for $248,000. The eco cabin has a small carbon footprint and is based at a 42-hectare property.